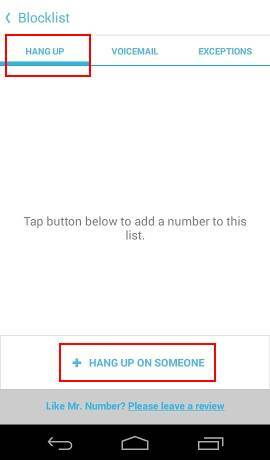 You can block disturbing callers in Moto G, Moto E and Moto X easily! Block calls and messages from certain callers! Update: if your Moto G, Moto X, Moto E, or Moto Z has been updated to Android Nougat 7.0 or later versions of Android, you can now use the built-in call blocking feature as explained in this guide. Sometimes, you may want to want to block some callers for whatever reason. But in Moto G (including Moto G 2014, or Moto G 2nd generation, Moto G 2015, or Moto G 3rd Gen), Moto E (including Moto E 2015), or Moto X (including Moto X 2014, Moto X 2015), you cannot find the feature to block certain callers. Then, how to block certain callers on Moto G, Moto E and Moto X? This guide will show you 3 different methods to block certain callers on Moto G, Moto E and Moto X. The most polite way to block the caller is to transfer the calls to voicemail automatically. The caller usually would think you are on holiday or you are busy with some other tasks. Start People app (or Contacts app) in your Moto G, Moto E or Moto X. Open the contact you want to block. Tap menu button (3 vertical dots) as shown below. 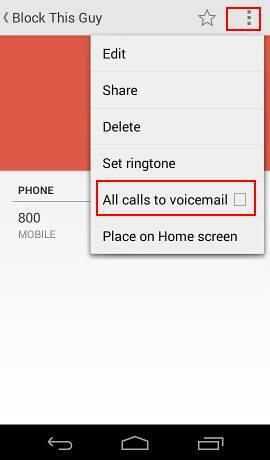 Tap “All calls to voicemail” to check it. Now, all calls from this contact will be diverted to the voicemail. Please note, this method of blocking certain callers only works when your phone is on. If you turn off the phone, the caller will get unreachable notification per the settings of your carrier. If you set call diversion (to other numbers) when the phone is not reachable with your carrier. The calls from these “blocked” callers will also be transferred to that number when the phone is not reachable. In other words, this setting is on your phone only. It cannot overwrite the settings of your carrier. And it will be overwritten by the settings of your carrier. 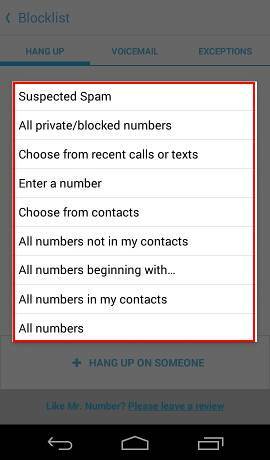 If you want to block certain callers that are not on your address book, you may use some apps to do the job. There are many such apps in the play store. In this guide, I will show you one of them: Mr. Number-Block calls & spam. The free features of this app are sufficient for most users. You can search Mr. Number-Block calls & spam in Google Play store. 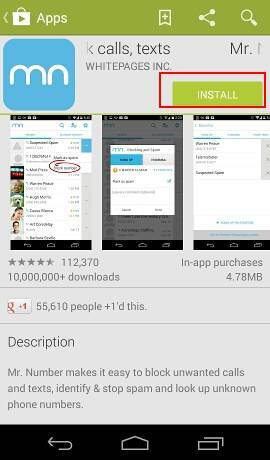 Once it is found, tap “Install” as shown below. 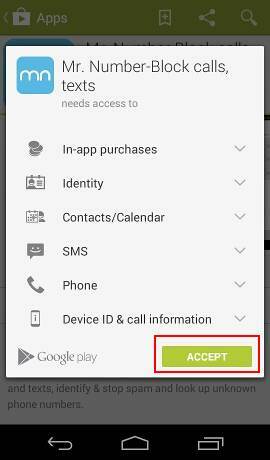 Tap “Accept” to acknowledge the permissions this app requires. The app should be installed in your phone. After the Mr Number app is installed, start the app. Tap the blocklist icon as shown below. In the block list page, you have the options to choose hang up or voicemail. This is how the app handles calls from anyone in the blocklist. 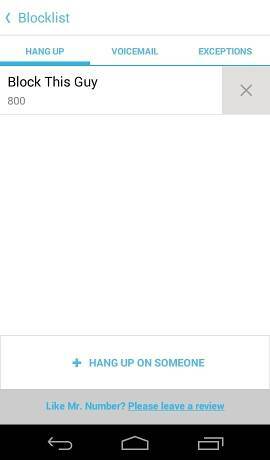 For example, you want to hang up the calls from certain numbers, tap “+ hang up on someone” as shown below. You will then prompted with the options to input the number, e.g., choose from a contact on the phone or type the number directly. Repeat the procedure for other numbers. Now, calls from anyone in the blocklist will get disconnected automatically (hang up) or be transferred to the voicemail. Please note, this method only works when your phone is reachable. It also can be overwritten by the diversion settings in your carrier. The bullet-proof way to block certain callers on Moto G, Moto E and Moto X, is to register it with your carrier. Most carriers have such service for free. A few may charge you. So, call your carrier to find out the details on their services related to blocking certain numbers. This method works even when your phone is off or unreachable. Can you block certain callers on Moto G, Moto E and Moto X now? If you you have any problems or questions to block certain callers on Moto G (including Moto G 2nd generation) , Moto E and Moto X (including Moto x 2nd generation), please post them in the comment box below. I have a moto E5 and every time my girlfriend calls she gets a busy signal. How can i get her calls again? Can she call others? Can you get calls from others? Is her number in the block list? You can erased the data remotely with Android Device Manager with your Google account. Of course, if the phone is offline, the command can be executed after it comes back online. If you set pin or password for the phone, then your data are very likely safe. Your data can be accessed only after the phone is unlocked. Hi ,I am using moto x play.I blocked two contacts using ‘Add calls to voice mail’. I check it often if still is block or not. Now I could see the contact is unblocked. I never did it manually. Is the number still in the blocking list? You may need to use full number (including +country code). I would really like to know how to block someone from text or calling me without downloading a app. Please help. How he blocks your number? Different methods and apps may have totally different settings/behaviors. Hi…I own a Moto X play , currently if anyone is calling after one ring it says that the number you are calling is busy and I get no notification as missed call or something.now am not even getting single call from other numbers. Also the drop down menu for notification which not working, Could you please help?? Who heard the one ring, you or the caller? If the notification panel is not working, you have to back up the phone and try a factory data reset. edit that contact, uncheck voicemail option from the 3dots from top right. Hi…I own a Moto G, currently if anyone is calling after one ring it says that the number you are calling is busy and I get no notification as missed call or something. Also the drop down menu for notification which shows settings, update on various apps is also not reflecting. Could you please help?? Do you mean the caller heard a connecting tone? Can you make calls from your phone? If you hear a ring from your phone, there should be a notification. Did you turn on any blocking settings? You should try to turn off all blocking apps/servings and try again. One ringing in your Moto G or in the caller side? Are you using one SIM or two SIM cards? Did you set any blocking? Can you follow this guide? I BLOCK A CONTACT IN CONTACT APP AS PER YOUR GUIDANCE BUT STILL I GETTING CALL FROM THAT NO. I NEED TO CHANGE ANY SETTINGS? When you get the call, what’s shown on the screen? Is the caller number correct displayed properly? You can ask your phone company to block certain numbers. This is the cleanest way to block certain callers at network level. Apps can only block callers at device level. How will I know that someone was calling me when I am on a call in moto g 2? This requires call waiting. It depends on your carrier. You can check call settings to enable call waiting so that you will get the option to connect to the second caller or not when you are talking with the first caller. Did you follows the guide? voicemail option isnt coming in my phone…what should i do..? Where? If you give more details of your problem, others may help you. I downloaded Mr.Number, it works great for blocking calls – they get sent to voicemail, but doesn’t have the hang up option. It doesn’t work for blocking text messages either. I have 1st Gen moto G phone. I just don’t understand why it won’t block text messages as well! Mr. Number can only block sms before Kitkat 4.4. Hangup option is not available since Lollipop 5.0. To block sms, you may try this app, or this one. i want to block proxy calls or calls from unknown numbers, how can I do that? Do you have any problems to follow this guide? Hi. Hope you’re doing good. I blocked a contact using “all calls to voicemail” feature on my moto x play. Can I know, by any chance, if the blocked contact is still trying to reach me? The contact can still message you. Also the setting is for the phone only. If you change phones, you need set it again. A better option is to ask your carrier to block the number completely. What errors? How did you block calls currently? I don’t wants to make or receive any calls except msg.what to do? the best solution is to ask you carrier to divert all calls to voicemail box. you can also set call forwarding on the phone. But your carrier will charge the airtime. In phone app, tap menu key (3 vertical dots), tap Settings– call settings– call forwarding. The third option is to use downtime settings in your phone (I assume you update the phone to Lollipop already as this feature is available on Lollipop or Marshmallow). Go to Settings– Sound & notification -interruptions– turn off calls under Priority interruptions, and set Downtime. I blocked through “All Calls to Voicemail” However, still i receive call from that blocked number. Do you have a voicemail box with the carrier? Some carriers don’t enable it by default. Some even charge for it. Simon are you saying yes to this marshmallow app? because I don’t know anything about these phones and such but I trust you so if you say to get it then get it I shall. Just give me the thumbs up. thanks Simon. You need read the details of the app and try it to see whether it meets your requirements. The app itself is free. If it cannot meet your demands, you can simply uninstall it. Also, you should onluy install apps that you need. I am using Moto G first gen. I have blocked some numbers. How do I know if they make call me or not???…. How did you block them? Hi I just bought a moto g two days ago & I used the “all calls to voicemail” feature to block sum1 from my contacts. It workd fine, but then I turnd it off to receive a 1 off call from my them. Now it won’t turn back on? The little icon box were u press to tick won’t stay on? Every time I press it, it just won’t activate? Also star icon is doing the same thing? But every other but button works? Meaning (edit, set ringtone etc) work? Are you using contacts app or other apps to manage the blocking? You can try to clear cache and clear data for Contacts app in Settings–Apps–All–Contatcts, tap clear data, and clear cache. Then try again. i have a Mot E. I believe someone who isnt one of my contacts, got a hold of my phone. Each time they call, the name of one of my contacts appears(its the same name all of the time). I’m guessing they are hoping I will answer the phone if the name of the caller is familiar.fortunately the number that appears isnt the contacts number. I just dont answer it. I just deleted the contact and re-entered it with a different name. Hopefully that will fix it. Is it possible to keep a caller from accessing a phone? Your contacts are by default synced with your Google account. In this way, all your phones can sync contacts easily. However, if you find the contact is wrong, you can check your contacts from your google dashboard. Btw, the caller cannot access your phone, or modify your contact. Hey, SImon. One more questions. My earlier phone was NOKIA LUMIA, where after blocking I could still get notifications that the blocked user is trying to reach me. Is it possible with my new phone Moto G 3? If yes how? I actually want to see if any blocked user is trying to reach out. Mr Number app does have a log of blocked numbers. Of course, if you choose to divert the call to voicemail in contacts app, there will be no log for you. Does method 1 block messages too? No, it’s for voice calls only. Good Though but if they give out a special feature of block then it would be great? What do you mean “manage”? You can block them by transferring to voice mail or using apps as mentioned in this page. I tried method 1 on my Moto E(2). The menu option in the contacts list is limited to “Share” and “place on home screen”. The phone does not show the other options that you have enlisted in this forum. Kindly advise. I bought a Moto E 2nd Gen yesterday. It has Lollipop 5.1. I too am trying to block some of my Contacts. However, the option to do so is absent. I explored many Contacts to see if it was a specific occurrence, but every Contact I’ve tested only offers the options of ‘Delete’, ‘Share’, & ‘Place on Home screen’. I even tried scrolling that menu, but those were the only available options. I’d really like to avoid a 3rd-party app re this matter, especially if it’s supposed to be a default function of the Moto E 2nd Gen. Help would be appreciated. Forgot to mention my carrier, which is AT&T. You didn’t tap the pencil icon to enter edit mode. Open the contact, tap the pencil icon (edit), then tap the menu icon. Ugh. It’s so obvious to me now. So that’s what “Open the contact” meant. Eureka. I am wondering though: should there be a symbol next to the Contacts I’ve diverted to voicemail? The ‘no sign’ or something like ø ? Because my blocked Contacts look normal. I checked the “block” box & saved, but I thought maybe there’d be an indication in the Contacts list. Unfortunately, no indicator for it in all Moto phones. Normally, people use groups to group friends, family members and relatives, annoying guys, and bad guys. It is easier to filter and maintain. You can create a voicemail-only group. Throw the contact to that group if you do not want to pick up his calls in a polite way. Tap the pencil icon (edit) , then tap the menu icon. Very likely, you didn’t tap the pencil icon to enter edit mode. I am not able to call a particular no. but able to get call from that number. 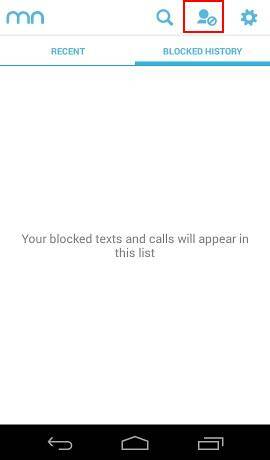 There is no option to check block list in moto g2. Maybe the other people blocks you. What exactly did you get when you call that number? I am keep getting calls and sms from unknown number on my moto E. I blocked the number but still getting smses. How can I block that number smses on my phone? Did you turn on SMS block? it does not make sense to say which one is better: iphone or Android phones. it is all about personal preferences. iOS and Android work in different ways. If you know Android well, you will probably know how to handle such things. And probably you will appreciate why Android works in this way. Android is about choices. If you don’t like Moto E, you can get one from Samsung, LG, HTC, or Huawei, or even Xiaomi. If you don’t like iPhone 6, what’s your options? If you think iPhone can meet all your needs, you should still get another iPhone as a spare phone. Android gives you options: can you get a $129 iPhone? If you want to compare iphone with Android phones, try Nexus phones or Moto X (although both cost less than half of iPhone 6S+). It’s not an android issue: my samsung features the option out of the box…you should have RTFM before buying the phone…. Add them to spam filter. You can also ask your carrier to block any numbers. Simon u said about adding someone to spam to get rid of text messages, c no one calls me they all text, so could you please tell me in a way that someone like me can understand. About how to send their text messages to spam? I would really appreciate your help with this. Thanks so much. Did you use Mr. numbers app or any other apps? they can block both calls and messages. You can also use Hangouts as messages app. Hangouts app has the blocking feature. How did you block the person? Is there any Android app which has the ability to block a call without a ring and the caller cannot suspect that the number is blocked? Almost all the apps I have tried block the call with one ring and the choice I have is rooting which I don’t wish to try? To achieve this, you need ask the phone company to block the number. Most companies offer such filters. Apps cannot do this because apps only handle the call after your phone company connects your phone with the caller. How to save a new contacts in sim memory or in phone memory in moto e mobile? Moto E does not save contacts to SIM card. New contacts are always under your Google account. When you save the contact, it will ask you to sync with one Google account. In this way, when you change phones or use multiple phones, it is not necessary to copy contacts. It depends on how you are blocked. if you are blocked in carrier network level, they even don’t have such info. If you are blocked through apps, yes, most apps offer the blocking history. Does your Moto G ring? Awwn my motog with KitKat block them and never ring it! And now the lolipoop is not longer working it rings and can’t evens et a ringtone to none and have read that Mr block stopped working on this version of OS. Don’t know what to do or if downgrade is an option I’m getting crazy about this debt searching people from the last users keep calling me! You need wait for the developer to update the app. or 2. In contacts app, divert the call to vociemail. What did they get? no reachable? not answered? You should try it yourself. I use avast antivirus, which has a call blocking feature. it works quite well for me. The three little dots on my contact only offers – Share and Place on Home screen. How can I have the other other options shown? Tap edit icon (pencil) first for the contact, then tap 3 dots. You will then see all of the options. I think Mr. Number app can also block sms on Moto X. How many apps to install, this all are mandatory things why they don’t give default. It depends on user. Some users may never use this feature. In the Mr. Number app, there is a Blocked history for such info. I use moto g gen2.. How can I block SMS from certain number? Mr. Number shown in this guide can do this. You can also ask your phone company to block such numbers. you can also report to your phone company and they can also block certain numbers for you. You need find other apps. If it is a spammer, you should report to your phone company and they can block it for you. Check with Hangouts help. If Hangouts is your default sms app, you can block people with it too. What exactly is hangouts used for?! I will try to block numbers of that is the case using hangouts!! Hangouts app is for messaging (sms or mms) instant messaging and vioce/ video chatting. You can set it as the default messaging app. If you need block some numbers permanently or to report spam sms, you can contact your phone company. Hi…Some of my phone book contacts don’t able to call me. They able to call other and I also able to call them. What can be wrong?? I m using moto g 1st gen.
Did you block any numbers on your phone? What notification (not reachable or not picked up) did they get when calling you? You’d think they’d make blocking an easy to use native feature. You don’t need a real voicemail. All Incoming calls in my motoE 2nd generation has been blocked automatically yet i have not installed any app for it what to do? How do you know they are blocked? In the call log? Do you see any messages or notifications on the phone? Hi ..I am unable to call one particular no..and that person has not blocked me. So for checking I tried on her roommate but faced same problem. And again I tried to call on other no of her frd and call matured fine. My phone- moto g2 lollipop and I am unable to find any call setting or blacklist option in my phone. Note .. I am in roaming and this issue started since few days only and we both don’t use any blocking apps. What did you hear when you dial the number?